It a remarkable fact that this concert from the Edinburgh Festival in 1971 is of the Chicago Symphony Orchestra’s first tour away from North America since its foundation in 1891. At the time Solti was two years into his 22 year-stint as its eighth Music Director. When he took it on he was advised by one of its veteran players to regard it as ‘the best provincial orchestra in the world’. It certainly is one of the ‘Big Five’ in America and has always maintained its Germanic tradition and sound - which is why Solti, brought up on that very same tradition, felt so comfortable working with it - thanks to its first two Music Directors, Theodore Thomas and Frederick Stock, who between them directed it for its first half-century. As Solti himself put it, after the orchestra’s troubled years immediately preceding his appointment, he felt as Siegfried must have felt when he woke Brünnhilde from her long mountain-top slumber. He was its principal conductor 1969-1991, remarkably - and at the age of 59 - the first time in his career that he had his own symphony orchestra. When he resigned, he maintained his close links by becoming its Music Director Laureate from 1991 until his death on 5 September 1997. He last conducted it six months or so earlier in a programme which included Shostakovich’s Symphony No.15. 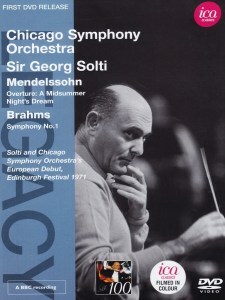 Where Don Bradman’s batting average in Test Matches did not quite make 100 (99.94), so Solti’s last concert with the CSO on 29 March 1997 was his 999th and he did not quite make his 1000th. This tele-recording (directed by Anthony Craxton for BBC2) is dated by the ghastly dress sense of the audience and those dreadful late arrivals who march across the hall to their rows and then disrupt the seated audience while the applause for the overture they have just missed continues unabated. What also sits uncomfortably today is the almost total absence of women in the orchestra. There is just one who sits on the fourth desk of the first violins and there are two cellists. In that regard they were shadowing their European counterparts in Berlin and Vienna. As always with music on film, you are in the hands of, or rather at the mercy of, the television director. Just when you want to watch the conductor manoeuvre an orchestra through a tricky junction, the camera crudely cuts away to whoever plays the tune next. On the other hand Solti is an uncomfortable conductor to watch. His arm movements make him jerk puppet-like, he is continually whisking his players into a lather, his face often contorted into lop-sided grimace. There is however wonderful clarity and energy to fuel the pulse of the music. The overture is thrilling, the violins skate like water-boatmen through those pianissimo string passages, the wind players achieve impeccable ensemble thanks to the flautist’s subtle direction (like a sub-conductor) of his seven surrounding confrères. In the Brahms - in which all four wind pairings are doubled - Solti’s tempi are extreme at both ends of the spectrum, the trio in the third movement Allegretto so rushed the players hang on to their conductor’s coat-tails to keep up. The finale is magnificent with Dale Clevenger’s Alpine theme on the French horn emerging bell-like from the sinister gloom of the introduction. With 46 years having elapsed since he joined in 1966, Clevenger still occupies that principal’s chair. Solti’s long baton continues to carve his way through the work which, if you listen to it with your eyes shut, has all the warmth, romanticism, love and tenderness which those gestures belie. That’s why I always enjoyed Solti at his best in the opera pit - in the opera house you didn’t need to look but do no more than listen to his wonderful music-making.